For 16 years, TBS had a unique and entertaining method of sprucing up its movie presentations: with quippy commentary and lots and lots of punning, movie-specific recipes. 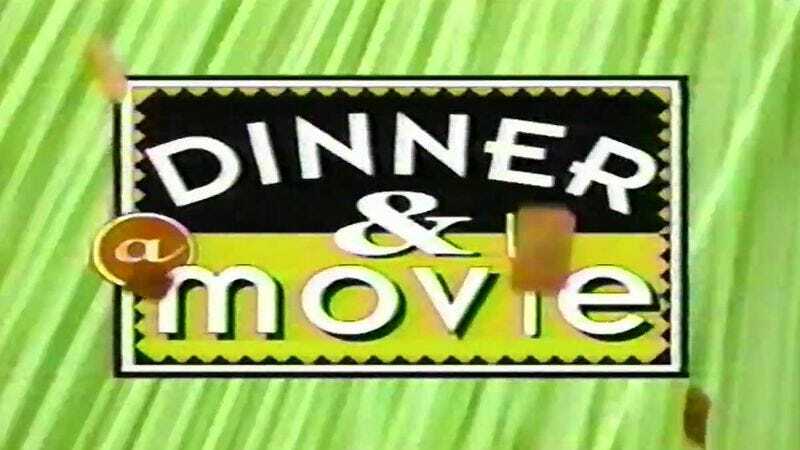 From 1995 to 2011, the basic cable channel’s Dinner And A Movie was sort of a Mystery Science Theater 3000 for foodies. Between movie segments, host Paul Gilmartin (of The Mental Illness Happiness Hour podcast), resident chef Claud Mann, and a succession of female co-hosts, including Annabelle Gurwitch, Lisa Kushell, and Janet Varney, would prepare and enjoy a dish that was somehow thematically tied to a particular film. Besides making the network’s 27th airing of Air America more entertaining, it was also an interesting way of adding at least two more senses, taste and smell, to the movie-watching experience. For those who miss the show or who never got around to watching it when it was on, the good news is that dozens and dozens of Dinner And A Movie recipes are still available online. Just the thing for that upcoming cinema-themed dinner party. Some of the food puns are delightful in their simplicity. The recipe for Fargo, for instance, is just “Snow Coens.” And what goes better with Showgirls than “Pasties?” Other dishes are suggested by the ethnicity of a particular film’s characters. Saturday Night Fever is thus paired with “Tony Manero’s Mozzarella Marinara.” But Dinner And A Movie was at its punning best/worst when it went well out of its way for the sake of wordplay, as when it presented “The Hippocratic Loaf” for Malice or “Can’t Go To School, I Falafel” for Ferris Bueller’s Day Off. Now, all that remains to be done is for some Dinner And A Movie superfan to actually prepare all of these recipes, preferably while watching the appropriate movies, and then Instagram the holy hell out of it.